The illustrated Smith's Knife Sharpener is the Smith's 3 in 1 Knife Sharpener with carbide, ceramic and diamond sharpening options. 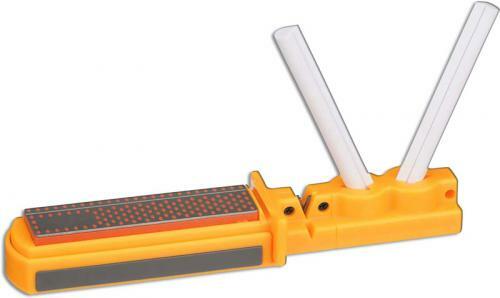 This Smith's Knife Sharpener has two pre-aligned reversible tungsten carbide cutting heads for quick edge setting capabilities; two teardrop shaped fine grit ceramic rods for sharpening straight edges, serrated edges and hooks; and a fine 750 grit Interrupted Surface diamond stone to provide a quick razor sharp edge on knives and tools. A molded synthetic base with protective storage lid, non slip rubber feet and rod storage slots is included with the Smith's 3 in 1 Knife Sharpener.